We began with simple percussion and wind instruments. Before long humanity gave us simple string instruments. Then complex ones. Eventually, someone came along and figured out how to make amplified instruments. And with that came the advent of the greatest instrument of all time: the bass guitar. It’s widely agreed upon that all other instruments are vastly inferior to the bass guitar, as will be all other instruments to come. So how do we as recordists and mixers possibly do justice to the greatest instrument of all time throughout the universe? How do we capture its pure glorious majesty? And why is the bass player still out of time? Bass is an instrument you can pick up in a couple months and spend a lifetime never mastering. The good news is that even if you aren’t seeking to master the instrument you can learn enough to understand it. There are many different styles and tones. Identifying what the bass player is doing is extremely helpful in figuring out how to engineer it. It also helps to understand some of the goals of playing. For example, if there are a lot of octave jumps in the rhythmic motif, make sure the tone control is set on the guitar in a way that helps bring those out. If the part is supposed to be tight and clean, watch your amp gain — less is more. If it’s supposed to be aggressive and big — pump the amp up. If the player is having trouble with the pocket, see if you can lower the action on the bass a bit. Notice how I haven’t mentioned anything about processing yet? Basses are very simple instruments sonically. 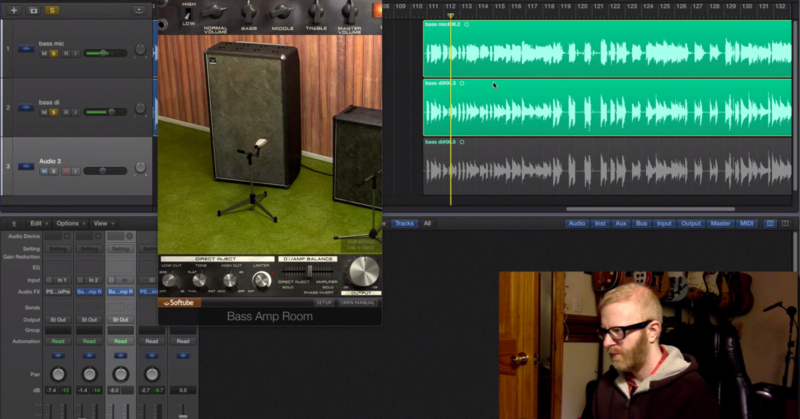 It’s very possible to get a bass recording straight in that requires no post-treatment. The vast majority of that comes from understanding the part and the player. Fingerstyle is the darkest tone and usually requires a little bit of drive to stand up. Even just setting the gain higher on a DI to get a touch of wool can go a long way. Experience has taught me that if you have guitars or dense synths, more gain on the bass will help. It might sound a touch too fuzzy in solo, but that’s usually where it sits right in the mix. The main thing to look out for here is player dynamics. Fingerstyle is the most naturally dynamic way of playing and while compression can help — perfecting the part is ideal. I’d rather comp in a couple takes to make the dynamics even, than to rely exclusively on volume automation or compression. That said, I do like the sound of an 1176 on bass guitar (particularly the Urei H or Purple MC77 because they are a bit edgier sounding). Even with the compression itself in bypass, the circuit just works well and can help with that touch of fuzz I was talking about a moment ago. Playing with a pick is a much brighter tone. My big tip for this is to really listen for how the arrangement changes the tone of the bass. Picking the higher strings on a bass really begins to sound like an electric guitar and the fullness can disappear. From a production standpoint, and this is a generalization mind you, I try to work with the bassist to keep picked parts on the first two strings and/or toward the top of the board. That said — the music comes before the sound. Another option is to do multiple takes and adjust the tone controls to push extra weight into the high notes and create a comp. Slap is extremely percussive. As is any sort of plucking style. This is one of the approaches that I do find really needs processing on the way in — particularly if the bass is being DI’d. An amp can naturally round out slaps and plucks. With a DI you really need a fast-acting compressor on the back end. It’s also fairly common to overdub individual hits if the part isn’t really a “slap” part. Slap is sonically so aggressive it’s worth considering strapping more than one compressor in line on the way in. Thumb playing, on the other hand, is the exact opposite. It’s a very round sound and usually needs all the help it can get in letting those transients through. This is almost entirely dependent on the player, but a compressor with the attack set very slow and the threshold set fairly low can kind of reshape the bass to be a bit more punchy. Outside of processing, the most important thing for me is to listen to the release of the bass notes as they are being played. Note duration is very difficult to fix in post. Timing can be nudged, tone and punch can be altered, but if one note is bleeding into the next there’s really no fantastic fix. Controlling the note envelope, particularly the sustain, is a big challenge in bass. Adept players can time their note durations very well with muting techniques. Less experienced players tend to either over-mute or more commonly, allow too much ring when they play. If your bass player doesn’t have a strong muting technique, placing a piece of foam behind the bridge or between the pickups can help. Picking up the bass and playing around a bit can be a fast teacher in what to listen for. 2. Bass or Low Guitar? How we process anything completely depends on what that thing is intending to do. If we are talking about Pop and Rock, the bass is usually falling into one of two camps. Either the bass is intended to be a standalone thing and is kind of the shining hero of the record, or it’s kind of acting like a low guitar. Think heavy Funk influence for the former, like Red Hot Chili Peppers or Charlie Puth (ok, I know it’s actually a synth here but I needed an example). For hard Rock stuff, we will generally hear the bass as a lower guitar part, and it is meant to blend into the wall of guitar sound. Generally means I’m generalizing, let it go internet, let it go. This really determines what kind of space we are giving the bass. In harder Rock tunes, I find the guitars really want to have low-end of their own to feel powerful — and if that masks the bass a bit, that’s ok. Think of it like the guitars and the bass are holding hands. They intersect sonically. For funkier stuff, any guitars or synths really need to get out of the way so that the articulation of the bass is clear. Keeping the low range clean is key here and can actually be addressed simply in how the voicing of other instruments is arranged. If the keys and synths are played in the middle octave and above, and guitar parts are voiced with lots of inversions or simply without the lowest string present, then the low end cleans itself. That said, sometimes we want something a bit heavier and funkier in which case EQ is your best friend. Even in 2018, I’m an amp guy. I know it takes longer to set up. I know it takes a little more effort to sculpt sometimes. But I like the sound of air vibrating. I’m not mad at a DI — particularly those REDDI DIs, they sound really great. But I like the room to give me just a little back, I like the speaker to bend with the gain structure, and I like the character from all those working parts. I also like to combine a DI and amp signal. I’ll be talking about the processing side of mixing a DI and amp later on — for now, I just want to talk about phase. Whenever we’re blending a DI and an amp, it’s extremely important that the signals are in phase. Because a DI moves at the speed of electricity, and the microphone on the amp is picking up something that moves at the speed of sound, these signals are usually a hair out of phase. Either manually aligning them by eye, or using a plugin like Sound Radix’s Auto Align is a necessary step. Once this is done, I’ll generally bus both signals together onto one mono send. I touched on this a bit with the guitars — but a lot of how the bass sounds depends on how everything else around the bass sounds. If we get the recording solid, we really don’t need to go crazy on the bass to put it where it needs to be. One of the easier aspects of this is simply getting other instruments with low tones out of the way. If we want our bass to stick out, making sure that pianos, low synths, and guitars are lighter in the low end will help. The trickier side of things is when we have other elements that have to be on the low side. As I mentioned, with powerful guitars we just might need to compromise. This would be true of something like a love ballad too where we might want the piano to be big and the bass is really just there to add weight to the record. When this isn’t the case, we can low-shelf off a bit to give the bass some room. Then there’s the kick. In Rock records, we typically want the bass to occupy its fundamental range. Basses don’t naturally have a ton of sub. At least not a four string. Kicks, on the other hand, do have naturally occurring sub-tone. My approach to Rock is (generally) to allow the kick to eat the subrange and make sure the sub on the bass itself is tight and not overly pronounced. The overtones and growl of the bass tend to live in the low-mids along with the fundamental tones of the guitars — so I’m generally looking to attenuate that range on kicks, and get the punch of the kick from the higher midrange. The bass itself doesn’t generally need much happening in the upper-mids, so I’m going to attenuate a fair amount of that to let the punch of the kick and crunch of the guitars breathe. This kind of puzzle piece EQ’ing is kind of old school, but still very effective. Now, if the bass and kick are both supposed to eat the low end, like in a Pop record, we may need a different approach. For this, we make space with dynamics by putting a compressor on the bass and sidechaining it to the kick. This means that the compressor applies gain reduction to the bass, but it actually reacts to the kick signal. So every time the kick hits, the bass ducks in volume. By setting the attack and release very fast we can get the kick to poke out through the bass just long enough for the kick to be heard clearly, but not long enough to notice the bass has ducked down. Let’s say we want to give the bass guitar a little magic even after all is said and done. There’s no one thing that I do to bass guitar, but there’s a lot of concepts I find myself revisiting when needed. In most styles of music, I usually want a consistent, solid low end. If I have both an amp and a DI, I’ll usually compress the DI signal very hard when I blend the two. Because the DI is so clean it can generally handle very aggressive compression pretty well. By compressing the DI and keeping the amp more dynamic, I kind of get the best of both worlds — a consistent low end with dynamic articulation. If I don’t have both signals, grabbing a multiband compressor and just locking everything under 150 Hz in place with medium attack/medium release compression works very well. The character of a bass is really defined by its overtones. Sometimes we want a very round, smooth bass. However, we often want something with a bit more bite. And if the sound isn’t there to begin with, parallel distortion may be a good option. This means mult-ing the bass guitar and distorting the crud out of the copy. From there we blend it in with the dry. This can be a very effective way to fatten up a bass guitar and give it some character. For Pop tracks or experimental Rock/Indie, we sometimes want a wide bass sound. My go-to technique for this is to send the bass to a chorus effect and then filter out the low end on the chorused return. A stereo chorus without the lowest frequencies is a great way to stretch a bass guitar across the stereo field. On occasion we just want the bass guitar to knock the sh%* out of the speakers. We have to be careful doing this because presumably there will be a kick drum to contend with. But, a subharmonic generator like ReFuse Lowender can add a ton of sub in a way that EQ just can’t do. There are also plugins like MaxxBass that generate harmonics to enhance the perception of the low end. These are good for getting very dark basses that need to stay dark to pop out over small speakers. I mentioned before that I am a fan of amp sounds. Sometimes all we have is a clean DI, but we want more character. 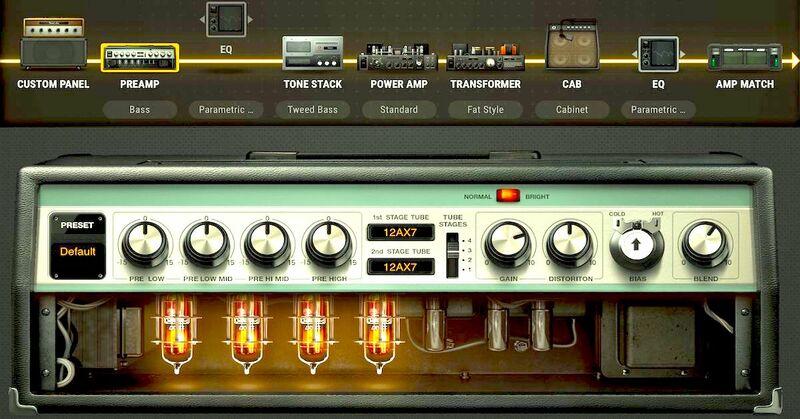 Amp Simulators like Guitar Rig or Positive Grid are great for Pop tracks or songs that are heavily synth-based. They sound much cleaner and synth-ier than re-amping, but sometimes that’s a good thing. If we do want something more authentic sounding, re-amping is the way to go. Personally, I’ve never felt a re-amp has ever made me fall in love with a bass DI, but the cool thing about re-amping is that you can port to multiple amps. I’ll usually get my main sound through my Ampeg while tracking in a smaller guitar amp and making a blend. In other words, the pro of re-amping is that we get to experiment and try weird stuff. This is something I have yet to try, but I’m really amped to set up (pun absolutely intended). When I pump my mains, the studio walls in the bathroom shake like crazy. I want to stick a couple of C414s in there and mic it as I play back a bass track and then blend the wall shake into the sound of the record. Recently I’ve been experimenting with Melodyne on bass guitar. Pop is in a very synthetic phase at the moment. There isn’t much in the way of acoustic (or acoustic-electric) instruments on the radio. Lots of drum replacement, programming, DI’d guitars, etc. Putting aside the lamentable aspect of not having real instruments, I’ve been using Melodyne to lock bass guitar into perfect pitch. A tuned instrument could still be +/- a few cents and still be “in tune”. Pitch correction just locks it in. Melodyne also offers the ability to mess with the harmonic structuring of the bass guitar which can turn it into a more “synth” sounding element. My secret bass weapon in mixing is Surfer EQ. This unique EQ tracks the fundamental note of the bass and allows you to EQ frequencies in proportion to the fundamental EQ. The EQ band actually moves along with the note, going up in frequency as the pitch goes up, and going down in frequency when a lower note is played. This allows the bass to be tonally sculpted to perfectly match what the song needs. Normally if we wanted to pull up the fundamental range of the bass we would have to do a wide bell boost around 100 Hz — which would also pull up some higher and lower frequencies, and change the dynamic of what’s being played (every time a G is played it would be enhanced more than every other note). Surfer EQ lets us pull up the fundamental notes to the same proportion regardless of the note being played, and without pulling up a bunch of extra tones. Ultimately, like most things, mixing bass is simply deciding what you want and then figuring out how to get what you have to that destination. The magic is always in the decision making. Hopefully, this article has given you some food for thought as well as some techniques in order to get there.